« SkyWatcher 90mm Maks sold out? I am sorry to say that I will probably be around much less frequently for the next two or three months. I have severely overcommitted myself this spring and for the next few weeks I have to pay a succession of pipers. I hope I can find little spaces here and there to post. I will certainly try, but no promises. In the meantime, I’m happy to see that comment-thread conversations are rolling along just fine without me. I hate to take off when it feels like things are really hopping around here, but that’s the shape of life right now. Before I go, here’s how David DeLano put his GalileoScope on his SkyWatcher 114N OTA as a superfinder, which itself has a red-dot finder. David was already working on this before I posted about homebrew finders, so I can’t claim any inspirational credit, it’s just a nice example using, in this case, some commercial rings David found on sale. Understand fully how life sometimes can jump up and overwhelm you with commitments. I hope you can find time to post stuff whenever possible, because your comments are always a lively read, always informative, always enjoyable. Try to find some time to get the little Mak out there and let us know how it went. Speaking of which. The weather up here is just relentless this year, cloudy and cold and wet all the time. So I took the Mak out a couple of days ago in the early afternoon and set up in our front courtyard on a small outdoor table and popped in the 32mm Plossl you recommended. I focused on the top of some tall fir trees about a quarter mile away and, almost unbelievably (well, to these Mak-inexperienced eyes) I could actually COUNT the individual needles on the smaller branches. Incredible! And razor sharp images they were. I think this is going to be a fine little scope, the perfect complement to my StarBlast 6. Take care, and check in whenever you can, as often as you can. And David, quick question for you. I was thinking about buying a Galileoscope, more as a curiosity, an accent piece with some astro-historical cachet to have around rather than as an actual “working scope” but still would likely take a peek out of it now and then. I see that you have put yours to some good and creative use. What are your thoughts on the Galileoscope? Worth having? I bought the Galileoscope (hereafter referred to as the GS) from the original shipment, and I bought 10 – 6 went to co-workers, 2 were set aside for my kids (and they have them now), and I kept 2. I still have one in original condition, and the one you see mounted here is the one I use. Since I bought it early and in bulk, it cost me around $20, including the shipping. They go for more than that now. There is an alternate place to pick on up, Learning Encounters, but their web-site is undergoing some rebuilding, and you can’t currently buy anything from them. In short, I love this scope. It was my first scope, and I continue to use it as my grab and go. It’s objective provides sharp views, and it is a joy to have out and explore the universe. In fact, part of getting it mounted on the 114N was to make sure I can still use it standalone. I also put together a finder shoe on a dovetail, and put a dovetail saddle on my photo tripod based mount, just so I can switch it back and forth. Also, it serves as the finder on the 114N, but it also serves as a refractor to enjoy the views alongside the reflector. It now has a 30mm EP in it as a finder, but that can be swapped out at any time. Now, this scope has also been a real pain, but in a good way. It is how I broke in to what scopes are all about. It has been put together and taken apart multiple times. It has been modified to no end. In the end, I have a very usable scope, but it didn’t start that way. What I went through was figuring out a good way to focus, and how to use it with a diag. I’ve gone through multiple iterations of this and what you see is the final product. The easiest mod, and the one that kept me from giving up, was to mount a Red Dot Finder on the front sight. The RDF is really a Daisy BB gun sight that cost me around $5. It is clamped onto the sight, which eventually formed a slight notch, which I actually made deeper with a saw this last go round. I don’t think it’s going anywhere now. The scope is too long to use a diag. The first fix for this was to screw a Barlow lens onto the end of the diag. This works, but one still has to use the push/pull tube to focus. The focus solution I came up with won’t work with the Barlow lens addition (it actually changes the magnification rather than the focus) so I eventually sawed the end of the GS off, just beyond the rear baffle. That was a guess on my part, but it works for the most part. I found a plumbing part that slides onto this cut off end, and the other end screws down to hold the diag direction (focus tube no longer used). On the EP end of the diag there is a helical focuser. This works for most Plossl EPs. I have a few EPs now where it won’t go in/out far enough, depending on the EP, to focus. The recommended fix for the length, and the one that I used for my kids’ scopes, is to buy the diag kit from Learning Experience, when it is again available, which contains an F11 (vs F10) objective and lets a diag work with no issues (and the push/pull focus can be used). Getting a helical focuser is nice, but there is no ready supply of them, and they aren’t cheap. Also note that the only diags these focusers fit on are prism diags, but if you get a good one, that should not be an issue. StellarVue will likely sell you a diag with the focuser, but you have to call or email and ask about them and they aren’t listed on the site. It was nice to be able to build the GS EPs and Barlow from the kit, and they do work, but the first thing I bought was a 20mm EP, a diag, and a Barlow (with removable lens to use on the Barlow). I understand how the EP lenses work now, etc, but they were a bit of a pain to actually use. I still have all the parts, in case they come in handy some time. Also, the EP lenses are plastic, whereas the objective is a cemented doublet made of glass. So, yes it’s worth getting one, as long as you understand that it takes some effort to get it to work. It’s only real drawback is that it’s only 50mm. The objective itself is very well spec’ed, and I think the newer ones are even to a higher spec (I know for sure the Learning Encounters F11 objectives are). So far I have one spare objective, and I’m definitely holding on to it to build a scope from it some time in the future. So you now have a set up consisting of 2 scopes but 3 functions: main scope reflector with the attached GS as BOTH finderscope and independent refractor. A unique little triad, likely the only one of its kind. Your positive comment about the quality of the GS objective lens is shared by others who have reviewed the GS, most of them veteran astronomers who, again like you, also praise the build quality and performance of this scope, often expressing mild surprise at just how good it is given its low price and mainly plastic parts. So I am going to go ahead and get one, both as a now and then working scope and as a sort of astro-historical connection to the Galilean era. There are a couple currently on EBay so I will see if I can score one at something less that the $50 Amazon currently charges. Thanks once more for your in-depth reply. Good reading! OK Matt – we’ll hear from you whenever! Feel free to ask me any other GS questions. I really have been around the block with this scope, and anyone else would have given up on it. I even had to disassemble it to get it through the rings, then figured out I needed to mount it from the other end, so took it apart and went through the whole thing all over again. Will do, David. I am not the handiest guy when it comes to assembling things, but my wife is a whiz, so she is my first lifeline should I get hung up. But I watched a couple of videos on YouTube showing the assembly process and it looks pretty straightforward. I did get one on eBay, $35 including shipping, so about 20 bucks less than Amazon. I am strangely excited at the prospects of putting together and using such an inexpensive instrument. Thanks once more for all the great info and follow-up offer. I will keep you apprised and post something here once I have the GS up and running. Terry, you need one of these, too! Just pulled the trigger on a Galileo Scope on Ebay (thanks for the heads-up Doug!). I figure this will be more travel-abroad portable than the FirstScope/FunScope because it’ll take up less space. Can attach a camera/video tripod (which I always take with me) on it as well. Hey Terry. Way to go. Welcome to this exclusive club! I think this scope is going to be a lot of fun, both the assembling and the using. I think I read somewhere that with this scope at 17X (one of the included EPs, I think) you pretty much see exactly what Galileo say in 1609. If true, this is an exciting prospect. There is one configuration with one of the EPs you can built that gives the “Galileo” equivalent view. I don’t remember exactly what it was, but I think it involving using parts from the Barlow and one of the EP’s. You could use it like that, but have to change something to be fully functional. I just watched an assembly video on http://www.teachingwithtelescopes.org and it explains how to get the “Galilean Configuration” of either 17x or 18x (seems to vary depending on the source). When assembling the EP with the two smallest lenses, you make sure that the FLAT side of the front one points toward the big end of the EP. Once done, you can also change up this Galilean EP to make the 2x Barlow, but from what I’ve read it is all but worthless on the GS. Whatever, all the directions are in the video. Galileo’s scope would be worthless by today standards, too. From a “here’s what Galileo saw” standpoint, it is accurate from what I’ve read. But, knowing I can do better, it’s difficult to use that configuration for general observing. It was really like trying to look through a straw. But, it’s worth it to at least try it. Oh, I don’t plan on making the Galileo Configuration my main EP once I get this scope; I just will set it up this way for a few days or so just to get a feel for what it looked like up there through early 17th century eyes/instruments. A historical curiosity-satisfying endeavor only. As it accepts any 1.25″ EP, I will probably do a run through with my Plossls, even an Agena 15mm SWA I just got and eventually settle in with whichever of the included EPs works out best. But for me, at least part of the fun in owning this scope is the connecting-with-the-past feature. But I can also see how this experience will most likely have a short shelf life. Looking forward to getting the scope and testing it out. Will check out the video, thanks Doug. Hey, any more nights out with the C90 and/or Orion ST-80A? I already have the same 90mm Mak that Matt has and am thinking hard on the ST-80A, so I am eager to hear your experiences with either or both. My Galileoscope should be here tomorrow, Friday at the latest. My Galileoscope arrived today and I put it together easily. I was impressed with the image quality through the 25x, aka “Keplerian” EP. I took it out back and focused on some trees a ways off and the images were amazingly crisp and sharp, excellent color. Immediate response was: This is not a toy. Now, the “Galilean” EP is another matter. I inserted the 2 tiny lenses in the plastic EP the correct way, then tried it out and boy, next to nothing. What amounted to an enlarged pinhole with nothing really clear or even identifiable in it. So I took apart the EP and assembled the lenses into every possible configuration, then gave each a try. Same results. Am I doing something wrong here, or is this what Galileo actually saw? If the latter, he must have had some incredible eyesight. I think you said that you had used the Gallilean EP, and that you figured that I probably would not be spending much time with it. Well, based on the results so far, NO time at all with it as it is virtually useless other than for some kind of virtual historical experience. Unless I am doing something wrong. Didn’t even try the Barlow because the consensus is that it doesn’t work at all. But the 25x alone makes the scope worth it. And you can, of course use any 1.25″ EP with it, a big plus. Anyhow, I’d be grateful for any info you can pass along re the GS. For starters, make sure you do have the lens assembled correctly. There is a pictorial step by step that isn’t on the Galileoscope site that makes it clearer which direction the lens go in. But, I also seem to remember that to come to focus, the draw tube has to come out most of the way. That may mean that it isn’t going to focus on nearer objects and that you are going to have to get it out and try the stars/planets with it. Galileo mapped out the moons of Jupiter, so you should be able to, too. I don’t think I had it out on anything more than a star or two, as Jupiter was not yet up. The Barlow is actually usable, if I recall. I think I used it with the 25mm EP I originally purchased, since I was using the Barlow lens I bought on the end of the diagonal, so I could bring that set up to focus. HOWEVER, be careful when using the GS with standard EPs, etc. There is nothing holding things together except for friction. I lost my diagonal one night, and it has a nick in the corner as a souvenir. I’ve put a small hose clamp that has a thumb screw on it on the end of the draw tube to get more hold, and it also is a better grip to move the draw tube in and out. I don’t need it on my current set up, because the plumbing part on the cut off end is a friction fit collar, and it holds the diagonal in very securely. But, I made sure both kids had one for their scopes. You have to get this scope out on Jupiter before it gets too late. I’ve had mine up to 100x on a night of good seeing. I think I used a 10mm EP in a shorty Barlow to get there (the only short EP I had at the time was the 4mm from the FirstScope refractor). Ask if you have any other questions. I’m more than willing to answer. This has been my project for a long time now, and I still love the way the GS performs. I checked and re-checked against both the printed instructions and several YouTube videos, and I am (pretty) sure that the two small lenses are in the correct configuration, but I haven’t really tried the EP outside. But with the tiny fov I get, I can’t imagine I would see much of anything. Also, as I said, I arranged the lenses in every possible combination with no result. Maybe this is the way it is supposed to look. And I did run the draw tube the full length, and back, and out again, slowly. Perhaps I will have to wait until I can try it out at night, but up here who knows when that might be. The last time I was outside with my scope was March 23, and it has been raining or totally cloud covered every night since. But giving the GS a try is atop my list for the next night out. I’m afraid I am out of luck on Jupiter. The last time I saw it, it was already way low in the sky and I’ve not seen it since. But Jupiter was going to be my first target for the GS, that and Venus and the moon, of course whenever it showed up. But 10mm EP + Barlow for the moon. Noted. I did try a Sirius Plossl in there just to see how it worked, and it was a very snug fit on mine, but I can see how time and use could easily loosen up this fit. Even if I never get this Galilean EP thing sorted out, i still really like this little scope and can already see that it is going to be a lot of fun to have around. And the image sharpness through even the included 25mm is remarkable. Terry, when does yours arrive? I still think there is a focus issue. The closer an object is, the further out the draw tube has to go. If you can get a far away red beacon light or something similar, that might work. Also, you are probably fighting a pupil size issue. As your pupil is larger in daylight, it does funny things with the output light cone. For example, on a reflector, you’ll tend to have a hole in the middle of the view, due to the secondary shadow. With a narrower pupil, these problems go away. But, still, it is a tiny view, though it is possible to see through it. Got my GS on Wednesday and assembled it yesterday. I’m impressed with the views on the 25X EP, even with the plastic lens. The moon and Saturn looked good with that EP, although a real glass EP gave a brighter view with a larger FOV. The Barlow 50X views aren’t as clear. I plan to use it with regular 3-element and Plossl glass EPs. The main difficulty is in moving the focuser inwards and out. My inexpensive aluminum camera/video tripod worked well on this scope. Yes, I was able to get the smaller 17X EP to work – but wow, the view is tiny! Doug, the lens with the flat side is the one that is on the outside (i.e. the side which you are looking through). The concave lens (the one with both sides curved inwards) needs to be on the inward side of the eyepiece. Being so thin and light, I plan to pack this scope in my travel backpack when I go on vacation next week. Yes, isn’t it amazing? I never figured on images that crisp and sharp from plastic lenses, but I guess the glass objective lens makes all the difference. Scoring Saturn with a 25x EP in a $25 plastic scope is, to say the least, impressive. Right, it’s a very ragged fits-and-spurts kind of motion with the slider focuser, tough to really fine-tune it. I have the 17x EP lenses in the correct configuration but as you have discovered it is a VERY tiny little window. Other than the length, it would be a near ideal carry/backpack scope. Done any more work with your Orion ST-80A or C90? Update me when you do. I am still seriously considering the ST, but the other side says that it too closely replicates what I already have, so I am eager to see your thoughts on the benefits of having both C90 and ST-80. Plus a SB6. Now you can see why I worked to find a better focus solution, though I think now I could do it with the push/pull. My ultimate goal was to find something that could be made with easily available parts, but in the end I gave up. The helical focuser on the diag works, so I stopped wanting to make something myself. The next step is to add a diag, unless you are okay with the straight view. To use one, screw the end off a Barlow (you’ll need to find one that the lens comes off of) and screw it onto the end of the diag. This puts the focal point deeper into the scope so that you have enough room to focus. I am the 3-month neophyte here and you have much more experience as an astronomer, so I would be grateful for your thinking on scope choice, specifically your reason(s) for adding both the Orion ST-80A and C90 to your scope stable that also includes you (to be used one day!) StarBlast 6. I ask because I have both SB6 (a terrific scope) and the same SkyWatcher 90mm Mak that Matt has. And I am thinking long and hard about getting a ST-80A. It just looks like a first rate scope, I can use it with the very stable base that came with my Mak as both have the same 3″ long dovetail mount, and I like the scope’s portability and versatility. But I also find myself pausing because I wonder if maybe that in the SB 6 and ST-80A I have too much replication of function, that the ST may end up just a diluted version of my SB 6 in terms of performance. So I would much like to hear your thoughts on this, i.e. your reasons for buying these 3 scopes, mainly the ST-80A. Addendum. Forgot to add that I know that you don’t drive and use public transportation to get to your observing sites, so portability was obviously a key factor in your decision to buy the ST-80A. But then you also have your 100m SkyScanner, also highly portable. Would it be possible to get some advise on a setup capable of imaging the sun in H-aplha and Ca II K wavelengths. Hi Michael. Great question, but unfortunately not one I can be much help with. To even see the sun in H-alpha or other emission line wavelengths, you need either a purpose-built telescope or a tunable filter to go on the front of an existing telescope. Either path starts at $450-500 for a small (~40mm) scope or filter, and rapidly goes up from there–“mid-sized” emission-line solar scopes are usually $1500-4000. So although I think that stuff is cool, and I admire the results the people get with such scopes, it’s outside my experience. I’m more into easily-available, dirt-cheap solutions like the sun funnel. Cloudy Nights has a dedicated solar forum, you might go there for advice. Best of luck with the quest! Sorry for the late reply, but I was on vacation for most of the month. Reasons for getting the ST80A:: 1) wanted to see how a refractor performed compared to a Newtonian, 2) scope was on sale, 3) small and portable. Reasons for getting the C90 Mak: 1) scope was heavily discounted, 2) glowing review by Ed Ting, 3) small and portable. Reasons for getting the SB6: 1) it was on sale, 2) has 50mm more aperture than my Skyscanner, 3) the largest scope I consider portable enough to transport without a car (can be easily carried over one’s shoulder with the Orion carrying case made for it). If I ever use it, I can just plop the scope on the ground and observe with it sitting down cross-legged. All three of these scopes will show the planets and double stars better than my workhorse Skyscanner (although the latter is not too bad). If you have no problems using and transporting the Starblast 6, then I wouldn’t get the ST80A at all. The Starblast 6 will give you better views on planets, double stars and deep-sky objects than the ST80A ever will – as you said, it will be just a diluted version of the SB6 in terms of performance. The only reason for getting it would be to have a more portable travel-friendly scope that will give you low power wide-field views (compared to the Skywatcher 90 Mak). If you have money that you absolutely need to dispose of, a nebula filter such as a narrowband or O-III would be a better investment if you plan on doing a lot of DSO viewing. Can use it on all four of your scopes. These are just my opinions, but you can always get the ST80A and then return it later if you think it’s redundant. I remember your post some time back that you would be on vacation most of April. Hope you had some excellent observing. I ended up ordering an Orion ST80A in early April as they were $20 off with free shipping. As I suspected, and as you correctly called, it was, bottom line, a diluted version of my SB 6. The ST80A is a really handsome scope, and I wanted to find some reason to hang on to it. But I couldn’t. I took it out 3 times and, within maybe 15-20 minutes (clear nights being damn few in Oregon this time of year), I took it in and set up the SB6 which I keep on the floor in a little sun room we have and have to move only about 8 feet out the door to set it up on our back patio which is a decently dark setting. The views through the SB are just vastly superior to those of the 80. MUCH brighter and more expansive; easier to find objects, more enjoyable to view once found. I knew that if I kept the 80 that I would rarely use it. There was just no comparison at all between the two, the SB being significantly superior in all aspects. I sent the 80 back last week. I can see it as a most capable grab and go/travel scope, but at this point, this is not a need for me as I have a pretty good observing site literally 8-10 feet from where the SB is parked. And, if I ever do decide to do some travel-to observing I could buy one of the Orion custom carry bags for the SB. A friend of mine up here also has an SB6 and the travel bag and he tells me that it is easy to pack it up and surprisingly easy and comfortable to carry with just the one shoulder sling. He’s already taken it to a couple of star parties. Re, using the SB6 while sitting on the ground cross-legged. Have you considered one of those VERY tiny collapsible camp stools for viewing? They sit about a foot or so high and fold down to about the size of a tabletop tripod. Might be a good option for using your SB, and it would travel well. The one I got is a little nylon triangle that sits on 3 foldout legs and, when I’ve used it, it worked well. Thanks for the tip on the 0-III filter. I will check it out on Orion today. I read something by Rod Mollise last week about how well these filters work in urban and suburban settings. How has your experience been with the C90? Does it work for you on DSOs, even if just the brighter ones? I’ve still not used my Skywatcher 90 Mak yet as we have had just so few clear nights that I am reluctant to “waste” them experimenting with the Mak, and so go to the sure thing SB. But I want to use the Mak soon, and have to figure out what to go for once I set it up. Thanks for getting back to me, Terry. Always helpful to hear from experienced observers. So you actually did purchase the ST80A and ended up returning it! Yes the Orion Starblast 6 soft-carrying case is ergonomically well designed so that it balances perfectly on my shoulder the few times I’ve tested it. I was thinking about bringing a blanket and sitting on the ground with it. I’ve played with the Starblast 6 in my living room and I find that sitting on the ground, I can comfortably point the scope near the horizon and at the zenith in a cross-legged position. I’ve used the C90 Mak only in my light-polluted front driveway – never taken it out to my semi-rural site to observe DSO’s. But it’s great on the planets – never seen so much detail on Saturn and Mars before – thanks to its long focal length. Work, cloudy weather (and my recent vacation) has not enabled me to do any “serious” observing since I bought this scope (and the ST80) at the beginning of this year. Thanks for the update Doug! Good to hear back from you! Hey, what size EPs do you find work best for planetary observing with your C90? It has been so constantly cloudy and rainy up here that I haven’t had a chance yet to try out my Skywatcher Mak (same as Matt’s). I bought a new scope today! Well, used but new to me. Here’s the deal. I succumbed to Gear Lust today, but got an incredible scope, a 102mm Meade refractor (the OTA on this baby is huge; you really can’t tell from the photos). It has a GoTo Autostar base BUT no hand controller, so I can’t use that part. Guy in Multnomah Village had this listed for $60, and one photo showed the light turned on inside the motorized base. Since Sue French has a 102mm refractor, and seems to do almost all her small scope star hops with it to good results, I thought Well . . . That, plus once you go above 80mm in refractors, the price goes up fast, more so by a lot for 102s, and ridiculous for 120s. So here is what happened. I go to the guy’s house, he tells me that his roommate moved out and left the scope there. He called his former roomie and told him to pick it up, roomie told him that he didn’t want it and for the guy to do what he wanted with it. So he listed it on eBay for $60. Yes, SIXTY DOLLARS; it’s a Meade DS-2102. I thought My God, how can I pass this up? Well, I showed up around 2:30 to take a look and the focuser wouldn’t move at all, just stuck in place while I turned the knobs to no effect. I took out the diagonal and pushed down and around inside, then put the diagonal back in and did a little pushing and pulling and the focuser then moved in and out fine, albeit with some bumps in between. I looked below at the gear train (the part that looks like half of a zipper, the track the focuser moves on) and it was just totally gunked up. Grease and dirt and crud. I moved the focuser in and out all the way a few times and the movement evened out some. So I asked the guy where the hand controller was and, of course, he knew nothing, told me that the scope was all the guy left. He asked me what the AutoStar feature was, and I explained it to him, said that, of course, without the controller it was useless even though the base part lit up fine. That, and the gunky focuser were serious issues though, honest guy that I am, I told him that the scope itself looked fine and that good de-gunking could no doubt improve the focuser movement but that, without the controller, it was just a regular telescope. The whole thing was dusty and dirty with some scratches on the OTA. He told me that he didn’t want to give it to Goodwill, so make him an offer. I did, told him I would give him $25 for it. He said $30, half his asking price, and it’s a deal. So I peeled off a $20 and a $10, loaded up the scope and came home. I had done some research on it the day before, and the consensus from about a dozen sources was this: some said the Autostar worked fine, others said about half the time, others (a minority) said it never found anything for them (this group I wrote off as just not knowing what they were doing). All said that the tripod was a POS, wobbly and unstable, BUT every reviewer said that the optics were outstanding, made my Zhumbia (something like that) in China. So I figured what the hell, for $30 I get a Sue French size refractor with apparently excellent optics, and I brought it home. I spent about 45 minutes in the courtyard doing a total clean up. First off, I went over the entire thing with de-greaser (Awesome is the brand, buck a bottle at Dollar Tree; amazing stuff), gave it a good wipe down and in maybe 5 minutes it looked like a near new scope. Next, I took some auto scratch remover and worked on the OTA scratches, got almost all of them out. Then I took the focuser all the way out and worked on that gear train with degreaser and a toothbrush (it was just filthy), wiped off the excess, then sprayed on some WD-40 and ran it in and out a few times. MUCH better, just a few little hitches. Then I gave it a good coating of some heavy oil that is made for bicycle chains during the winter (called Cross Country Oil), worked it in with my fingers, and now the focuser moves in and out almost butter smooth. The optics are as advertised: Outstanding! I focused on a tall evergreen about a quarter mile away (and what a joy to see an actual upright image!) and I could see, in detail, individual pine cones! Razor sharp images of the branches. Everything a refractor is supposed to be. Even the tripod isn’t all that bad, especially when only partially extended, as in the photos which is how I think I will use it as I can sit down to observe that way. It actually seems quite stable as you see it in the photos. Nice little EP tray there to boot. 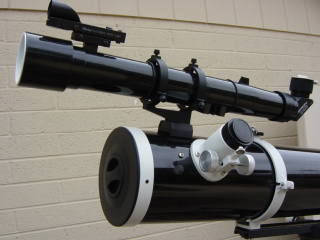 This thing sold new (with working AutoStar, of course) in 2006 for almost $400 and 102mm refractors, as I said above, go up almost geometrically in price from the 70-80mm sizes. This one cleaned up nicely! I should have taken some Before photos. So now I will try to find an AutoStar hand controller. Maybe. Or maybe I will just use it as a “regular” refractor. I think the images, mag, and brightness are going to be a big step up from the ST80A. I checked out a few of the hand controllers on EBay and they are pretty pricey. But even if I never get one, I end up with a BIG refractor. Now where am I going to store it? This is no GoScope or Mak that will fit on a shelf. Enclosing some photos below, but not sure if you will be able to open them. If not, and you want to see them, send me your email and I will iPhoto them to you. It looks like it has the controller, and if I recall correctly, is relatively close to you, so you might be able to avoid shipping. Thanks, David. Would have been a great pickup but the auction ended April 18. I hope it went for more than $55! What do you know about the Meade DS series? This one looks to be quite solid, very good build quality. the optics, based on just some limited viewing this afternoon, are superb. Have to now see how the stars and planets look. I may have a line on a controller in a small town about 30 miles north of here. Still waiting to hear back. This Meade 102mm is a beast of a scope! Can’t wait to try it out. All I need is a clear night, never a given up here. I don’t know much about it. It’s shorter than I thought it would be. I have an 80mm SkyWatcher that is 910mm long – this Meade appears to be around 800mm long. The outside aperture is 102mm, but the cleared aperture is listed at 90mm, making it an f9ish scope, though the manual says f7.7 – go figure. I like f10 and above. Aside from the mount, which can likely be made better with a lot of tightening, the issues I read with the scope are that the len cell/dew cover are too tight. The objectives might actually be pinched giving bad views. But, that can only be determined by looking through the scope. Do a star test – take your shortest EP and aim for a medium brightness star and see if you get concentric rings as you go out of focus. Even when the seeing is bad and the view is jumping around, you can usually tell if the rings are more or less concentric. If the lens is pinched, it will give noticeable distortion. Also, how much detail you can coax out of Saturn will tell you a lot, too. If you can get sharp details, the objective is likely good. The advantage to the larger objective is more light into the view, thus seeing more detail and dimmer stars. The longer the focal length, the easier the magnification, and usually the less color aberration. But, the EP can also effect the view. My opinion is, if the views are good, you have a good scope. I had people tell me the SkyWatchers were junk, but I have a refractor and a reflector both of which were well worth the money. Oh, and sorry about finding an expired post. Since it didn’t have any sold data, I didn’t even check the date. Another place to try to track down a controller is on the Cloudy Nights S&S forums. I ended up with a Celestron mount with no hand controller and tracked on down there. Excellent advice, David. I will do all this whenever we get out next clear night (July?). Just based on my little focus on the distant tree experiment yesterday the objective lens is very, very good, and this is the consensus of all the reviews of these DS scopes, even those critical of other aspects. So I expect to get some decent detail on the planets. I also have a little 90mm Mak, same one as Matt has, so it will be interesting to compare planetary observations between the two. Congrats on your new scope Doug! I would have snapped it up quickly even for $60, if I didn’t have the ST80 already. Like David, I’m looking at the Meade manual and this model (DS-2102) actually appears to be a 90mm aperture scope with a focal length of 800mm. As David said, you would want to test the scope for miscollimation and pinched optics. Remember, both of the ST80-A’s that Orion sent me came miscollimated. I returned the first scope (it also had a wobbly focuser), and I was able to fix the miscollimation on the replacement scope by loosening the lens retaining cell and tapping on the sides of the tube holding the lenses. But it still suffers from pinched optics – the star shows a triangular rather than a round shape when defocused. The result is that focused stars don’t show rings around the Airy disks like they do on the C90 Mak but instead, show three arcs representing the corners of a triangle. I’m sure I’ll be able to fix it (that’s why I didn’t return the replacement scope as well), which will require further tweaking of the lens doublet. Hey Guys (Terry and David). Not sure now what I actually have, other than this Meade is one damn handsome scope. Big and substantial and very “telescopy”-looking. In this series, Meade has (rather, had) both a DS 2090 (90mm) and DS102 (102mm), the latter being larger than the former, or so I thought. At least that is what the specs I have come across tell me. If I read you guys correctly, the 102 is actually a 90? If so, why would Meade make both of these scopes, if both were the same size regardless of the designations? I measured the diameter of the objective lens up front on mine and it measures 4″ which, I think, is 102mm. Though the OTA does appear to be a smaller diameter, maybe 90mm. In the photos of the two, the front hood (dew shield? Whatever.) on the 102 is clearly larger than that of the 90, a result I assume of the larger objective lens. So are these essentially the same scope? Doesn’t make sense to me. Whatever, the price was certainly right and my limited terrestrial viewing says Excellent Optics, and this is what matters most to me. Now I have to try to run down an AutoStar hand controller which, at least those currently on Ebay, are a bit pricey. No hurry here though, as I can just use the scope as is for the indeterminate future as I continue my non-GoTo, hit-and-miss stumbling around the sky. Thanks as always for your input. Every exchange here is a learning experience for me. The objective is 102mm. I found this in one of the reviews. The OTA is 90mm. However, the reviewer felt through some testing that the optical cone was down to 90mm before it hit the tube body. I noted that in the online manual, they only list it as 90mm, but that might be to cover their legal tails. Interesting that using 102mm the focal ratio comes out closer the documented value. So, as long as the optics aren’t pinched, it should be a fine scope. If they DO appear pinched, there are a few postings here and there on how to loosen it up a bit. And it could be that in your climate conditions, you won’t see any problems since you don’t get any extreme hot or cold conditions, at least not when you are viewing. love your blog! I am hoping to make a solar funnel for my astroscan. What eyepiece size do you recommend?? Thanks! !